One of the must-do experiences in Israel is a bath in the Dead Sea. You can book a tour from Tel-Aviv or Jerusalem. But you can also organize a visit yourself. 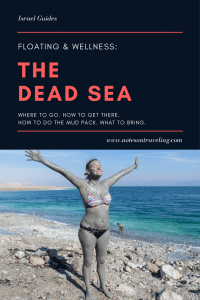 This guide tells you all you need to know about this big old lake, how to get here, what to bring, and most importantly: How to really bathe in the Dead Sea. 50 km long and at its widest 15 km wide, the lake was formed by the drifting apart of the African and the Arabian tectonic plates. Once it was part of the Mediterranean. But about two million years ago, the land had risen too much for the sea waters to still reach what is now the Jordan Valley. With its shores sitting 430.5 m below sea level the Dead Sea is Earth’s lowest land elevation. But it is also more than 300 m deep and therefore the deepest hypersaline lake in the World. Almost 35% salinity — about 10 times as much as your average ocean — make it one of the saltiest bodies of water in the World. Life cannot flourish under these circumstances. Boats will corrode in no time. Swimming is almost impossible (but floating is awesome). You simply flow back to the surface, if you are silly enough to try and dive in the brine. No wonder that the Hebrew name for the lake (ים המלח) translates to Salt Sea. Not inventive but true. Most of the water flowing into the Dead Sea comes from the Jordan River. 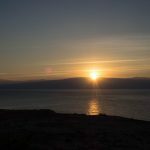 It is, therefore, no big surprise that Israel, Palestine, and Jordan, the three countries sharing both the Jordan River and the Dead Sea, are diverting the fresh water to their fields and cities before it gets lost in the brine. 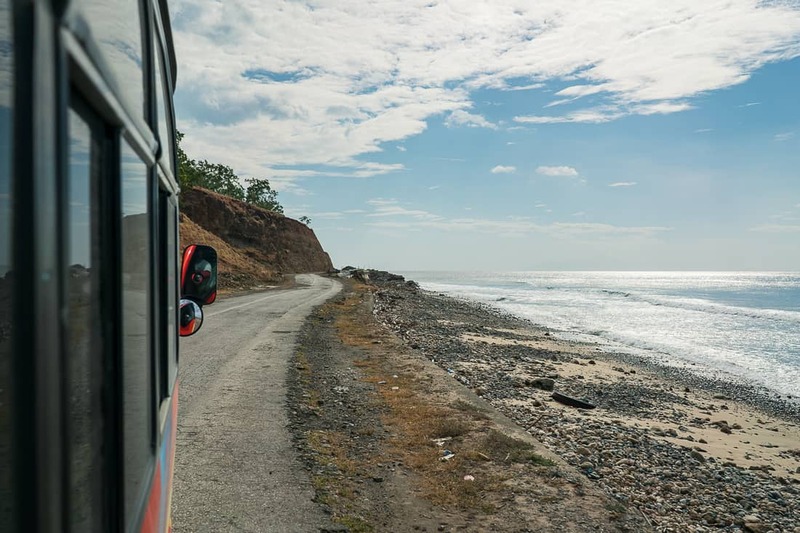 This reduced flow into the lake plus water extraction for salt production and other industries have led to a dramatic decrease in water levels in the past years. As a result, access to the water has become more difficult and dangerous. 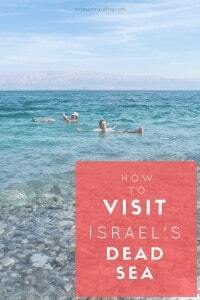 Below, I will explain in detail how to organize a visit to the Dead Sea yourself. 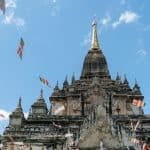 However, if you’re pressed for time or would rather have the added security of an organized tour, check out Get Your Guide. 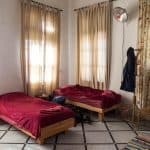 They offer several tours for different budgets that have been vetted by the team and other travelers. 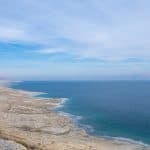 Tours from Jerusalem and Tel-Aviv often combine a visit to the Dead Sea with Masada and Ein Gedi Natural Reserve. I was fortunate enough, to spend a morning on Qerim beach with a local. 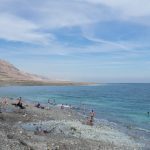 Mohamad, the head chef at the HI Hostel Ein Gedi, took me to his favorite beach and showed how to make the most of the mineral qualities of Dead Sea water and the mud from the Qerim hot springs. Start off with a bath in the Dead Sea. Float for 5 to 10 minutes. Don’t forget to carefully taste the water to find out that it’s really darn salty (bring water to rinse your mouth after). Get out and air-dry for a few minutes. Wearing wet swimwear will make step 6 a little more challenging with water dripping from the fabric. Some people simply go naked (depends on the beach you’re at). Gather mud from the springs. The color can range from light gray to tar-colored, depending on the mineral content of the mud. They say the darker the better. Qerim has lighter mud that is coarser. Mohamad found a friend and he gave him almost black stuff from a secret location; it was smooth and almost sticky. Apply the mud generously all over your body — from behind your ears all the way down to the soles of your feet. Let dry completely. Depending on the temperatures and the wind, this will take about 20 minutes or more. This is where tourists usually go wrong — they just let the mud sit for a few minutes and wash it off before it had ample time to nourish your skin. Once it’s completely dry, start to gently rub the mask in circular motions. Take special care with your face, where the skin is more tender. The body scrub will take off dead skin. Wash the remaining mud off in the small pools formed by the springs. The hot springs in Qerim are less salty than the Dead Sea but still no freshwater. Soak in the pools for a few minutes. Shower to wash the salt off your skin. Do not sunbathe with the salt on your skin! You are risking burns. Treat yourself to an olive oil massage or apply your favorite body butter. Ein Bokek: The resort village has a free beach that can be easily reached by bus from Jerusalem/Eilat (see below). There are showers and changing cabins available as well as snacks and dining options. However, you will share the beach with elderly people in bathrobes and you won’t find any mud here. Ein Gedi: Unfortunately, the free beach in Ein Gedi was shut after sink holes opened up and threatened to swallow the bathers and the adjacent campsite. Now, you have to pay about $20 entrance fee for the Ein Gedi Spa. Included in the price are not only facilities to shower and change but also a mini-train that takes you to the water and back. Additional services such as mud packs can be bought at the spa. Qerim: This beach is a local favorite, about 6 km North of Ein Gedi (look out for the small parking and sign). 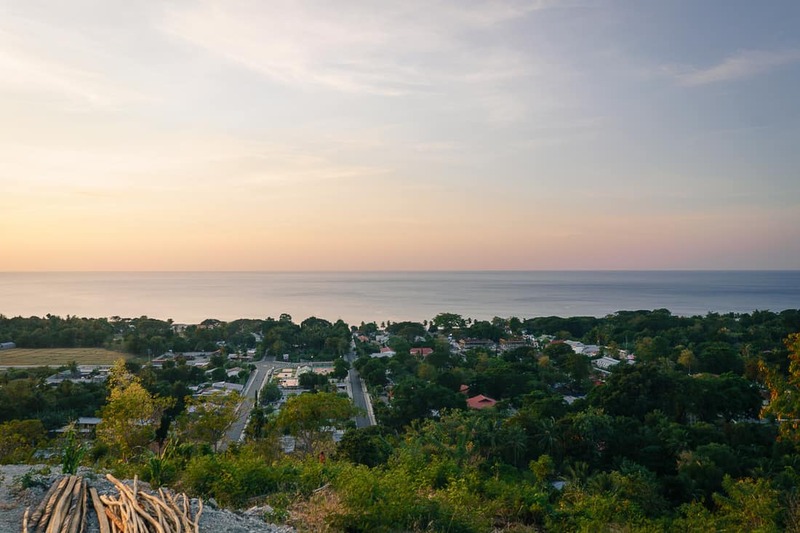 There are no facilities and access includes climbing down steep graveled hills. Even though the beach is by the main road, the buses do not stop here (closest stop is Ein Gedi). 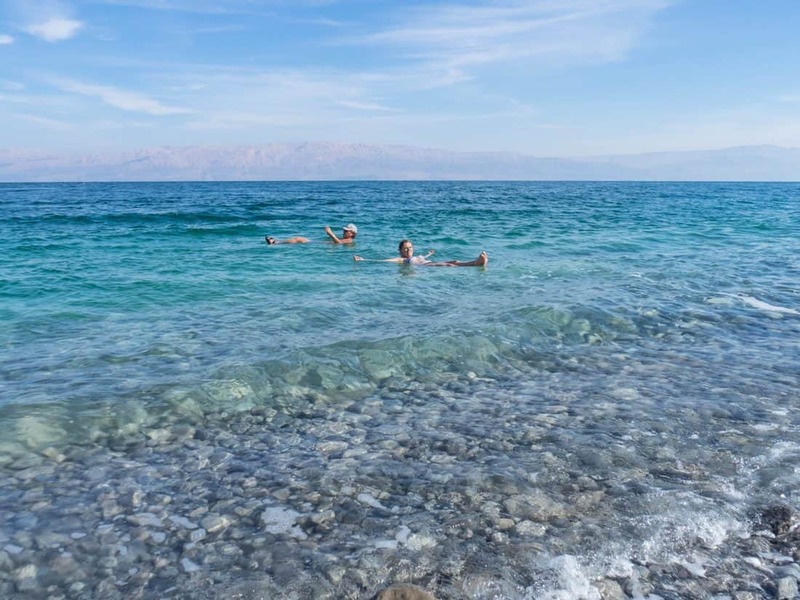 However, this beach has lovely hot springs with pools and water flowing straight into the Dead Sea allowing you to float between cooler lake water and warm spring water. Metsoke Dragot: This beach with cold springs is a hippie hangout and a favorite escape for young Jerusalemites in the summer. 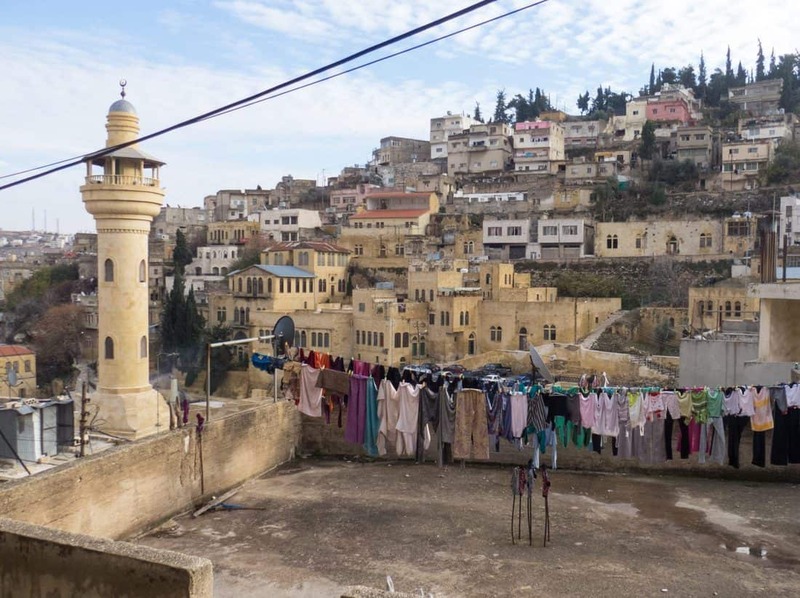 From Jerusalem, the journey takes less than an hour and Egged buses stop nearby. Though there are no facilities here, the spring water is freshwater, allowing you to hang out a little longer. This is not just a day at the beach. Therefore, you need to adapt your packing list beyond a good book, sunscreen, and a towel. Bring plenty of water — to drink (the salt will drain your body) but also to rinse your eyes should you get Dead Sea water into them. Pro tip: Wash your hands after you’ve been in the water to not avoid salt-on-my-eyes type accident. Super-pro tip: Bring the water bottle with you when you go for a float so that you always have it handy when the accidental splash happens. 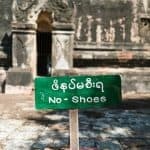 Because you will most likely have to walk along difficult paths to the beach you should have good walking shoes plus flip-flops or other shoes to navigate the gravel getting in/out of the water. The water is extremely salty. I cannot stress that too much! Plus, the darker the mud the more likely it will leave lasting stains. So bring swimwear that doesn’t mind the salt water (and the mud). Or skinny-dip. Bring two towels so you can keep one clean for your eyes. Don’t bring white (hotel) towels — the mud will stain them irreversibly. Don’t forget to bring a hat to protect yourself from the burning sun. Shade is rare along the coast of the Dead Sea. Public Transport: Take Egged bus #444 (Jerusalem-Eilat line) or #486 (Jerusalem-Neve Zohar line). With 60 min. from Jerusalem to Ein Gedi, #444 is considerably faster but also runs less often throughout the day. Ticket price is ca. NIS34 one-way (€8). 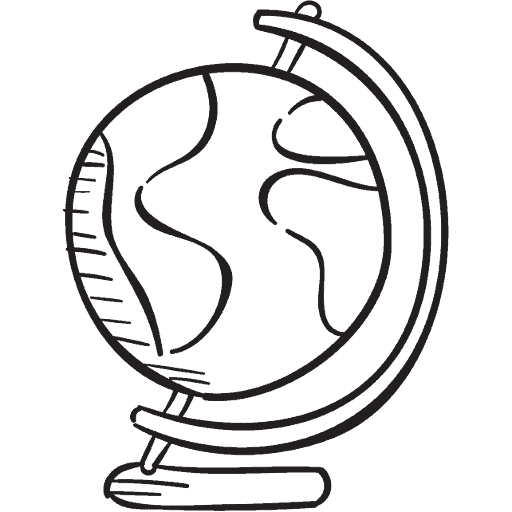 Click here to see schedules and prices on the Egged website (in English). Feel free to use the search box below for more accommodation options. Great post! I’d love to go here one day! Thanks for all the info and tips! This looks so interesting! I’ll definitely use this post if I go to Israel. Thanks for sharing! I did a study abroad in Jerusalem and one of the highlights of our sightseeing was floating in the Dead Sea. I wish I would have know about the mud baths. This is a great resource! 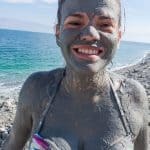 Wow I had no idea about this whole mud bath ritual! 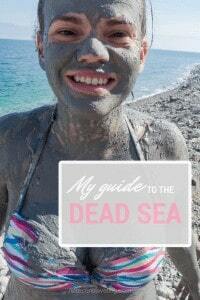 I thought the Dead Sea was just for floating around haha But your tips were definitely useful to learn more about it! Great post! Would love to have a mud bath there. Thanks for all the tips. Saving this for the future! You’re welcome! I hope you have the opportunity to visit Israel one day. It’s a stunning and diverse country. I absolutely had a wonderful time! Thanks for taking the time to drop your link. I’m sure readers will find your post interesting, too. This looks really cool. I would definitely want to do this. I will keep this guide in mind. Yes! I hope you get a chance to visit the Dead Sea — and Israel, it’s a wonderful country full of history, nature and great food. Great tips! The dead sea seems amazing, like a natural spa! I would love to visit. I hope you can make it here one day — Israel is so much more than I had expected. You’ll find mud at all of them. Nice post & thanks for sharing. I have a trip to Israel booked. My trip will start on August. 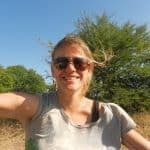 I have already planned to go for a bath to dead sea & I will definitely go through your points which you have shared here on the paragraph “How to bathe in the Dead Sea like a local”. Great event! I like your dead sea pictures.